This past cooking class, I had three kids again… and as Valentine’s day is getting closer, we decided to put together a heart shaped treat. In the past I had made some really yummy Apple Hand Pies, so I decided to use that pastry dough, but this time I wanted to change the filing a little bit, so we attempted to make Austrian Strudel Heart Pies. I used the butter that I like to use for making my pie crust (Kerrygold), but I think this time around using that one made our pastry dough too sticky. Next time I’ll use Land O Lakes, or skip the water amount for the dough completely. The filling was good, but next time I’d add ground almonds to the butter-bread crumb filling. Last year we made some really cute Heart-shaped sugar cookies, They were really yummy and simple too, so you might want to check those out if you prefer a simpler treat to make… however, I do feel these Strudel Heart Pies were a total hit with the crowd. The kids had a lot of fun making the pies, but I definitely came to the conclusion that three little cooks for my kitchen is too much. I need a bigger place!! Also, with all the craziness of making two fillings, the dough and the wrangling of the little cooks, we skipped story time altogether. In any case, here’s the recipe for what we did do. Enjoy! In a big bowl, put the flour, salt and sugar and combine. Make a well in the center of the flour and cut the chilled butter in little squares. Add to the center of the well and cut into the flour with a pastry knife until the mixture resembles coarse crumbs. Make a well in the center again, and then add the cold buttermilk and ice water a little at the time, mixing with your fingers or a spatula until the mixture is just combined... but making sure not to knead it. If the dough feels too sticky, add a little more flour until it holds together. Divide the dough into two flat circles, wrap in plastic film and chill in the refrigerator for at least an hour, while you make the filling. Pour the bread crumbs and almonds and work into a paste, until it is all moist and lightly toasted. Preheat the oven at 375ºF with the rack in the middle rung, while you make Filling 2. Place the chopped apples in a medium sized bowl. Sprinkle the sugar on top and mix well. Add the lemon juice, lemon zest and spices, and combine well again. Sprinkle the dash of salt and mix once more. Set aside while you prepare the dough. Take out the first disk of dough from the refrigerator. On a lightly floured surface or a plastic sheet, roll out the dough until it is about 1/4 inch thick. cut several hearts, about 2 inches in diameter. Cut them as close as you can. On a prepared cookie sheet with either a silicone mat or parchment paper, place half the hearts you cut about an inch apart from each other. Take a tablespoon of the Filling 1 and spread it on top of the heart shaped dough. Take a couple of tablespoons of Filling 2 and place on top of that. Take the rest of the hearts and cover the pies, using the tines of a fork to press the sides and seal the pies. Sprinkle a cinnamon-sugar mixture on top, then place in the oven for 30 minutes, or until the pies are golden. Use the rest of the dough and finish your pies repeating the previous steps. Let the pies cool off until they are ready to handle and enjoy! Tagged Baking and Cooking, Cooking with Children, Desserts. OOooh, these look very tasty. I’m not convinced on the filling (it’s a me thing, not you), but I think I’ll bake something like this for my BF Valentines Luncheon ~ maybe with brandied cherries or peaches. Let me know how they turn out! The dough is actually pretty good to work with, just make sure it is not too sticky before you get it in the fridge. Thanks for stopping by! 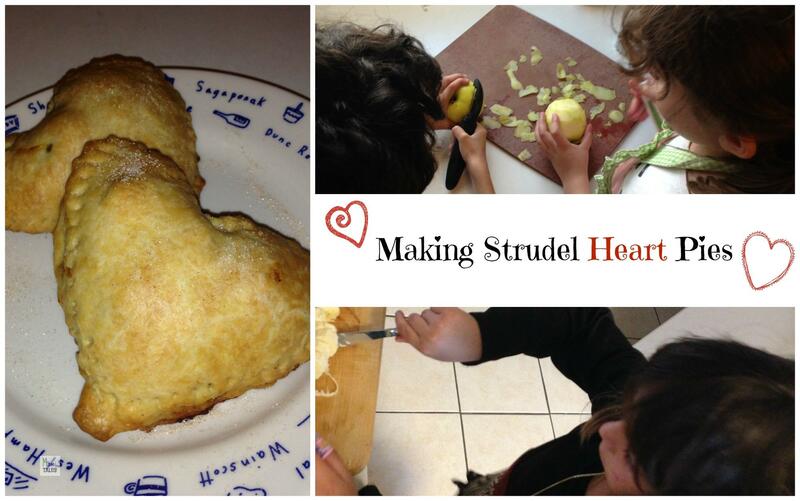 My oldest son has been begging me to make apple strudel! This looks like a great recipe to try. If I can get it together, maybe we’ll do it after school today. I’ll try to take pictures and send them your way. Thanks!